Regional Location Map of the Cygnus 3D volume. 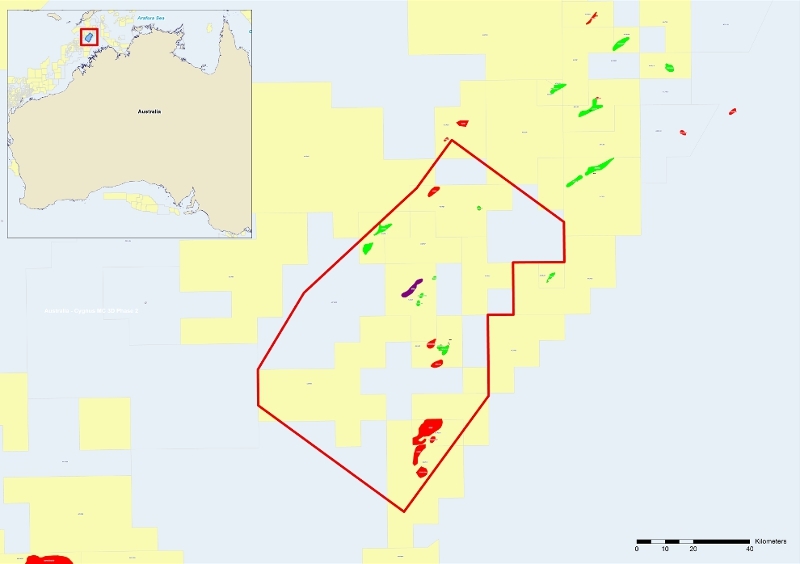 Polarcus, in collaboration with Spectrum and DownUnder GeoSolutions, is acquiring a 7,200 km2 RightBAND™ multi-client 3D seismic survey over the Vulcan Sub-basin, offshore north-west Australia. 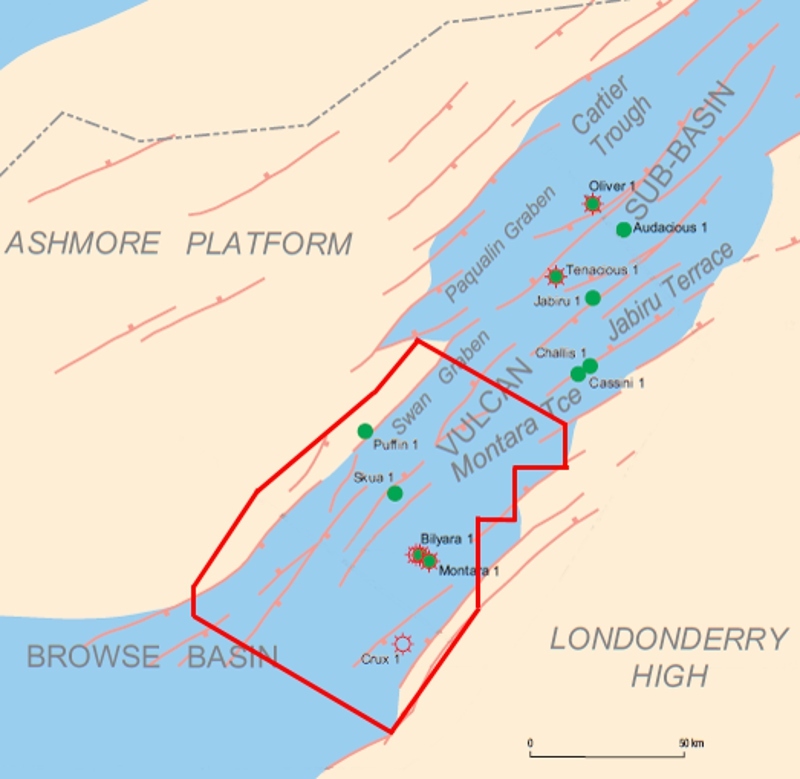 Historically, sub-optimal acquisition and processing strategies of the legacy data across the basin have not been able to address the geological and geophysical challenges, limiting understanding of existing proven plays and the evaluation of future upside. The broadband survey is being acquired by the Polarcus Naila using an XArray™ configuration of 10 x 112.5m x 8.1 km with a triple source and continuous recording. The PSDM seismic line below appeared as a multi-page pull-out feature in our print magazine. To subscribe to the print magazine use the 'Print Subscription' feature in the menu at the top of this page. SEISMIC PANEL: West–east Pre-SDM in-line across the southern Vulcan Sub-basin from the Cygnus multi-client 3D dataset. The Cygnus survey is located in the southern Vulcan Sub-basin, one of the most prospective areas of the Bonaparte Basin, containing oils that are normally very light. Integrated processing techniques shed light on this area, which has been historically hard to image. Figure 1: The Cygnus 3D volume with structural elements and selected well locations. (Source: from Cadman and Temple (2004)) The Vulcan Sub-basin is a north-east to south-west trending Mesozoic extensional depocenter located in the western Bonaparte Basin between the Ashmore Platform to the north-west and the Londonderry High to the south-east (Figure 1). It extends south-westwards to connect with the Heywood Graben in the Browse Basin, opening north-eastward to the Nancar and Timor Troughs. The sub-basin comprises a complex series of horsts, grabens and terraces which developed as an intra-continental graben in response to extension in the late Callovian. The Callovian Unconformity marks the base of the syn-rift sequence, which is of critical importance as it contains the source rocks that provide the majority of hydrocarbon charge to reservoirs above, below and also within the syn-rift sequence. Widespread marine conditions prevailed during the syn-rift phase with deposition of shales of the Lower and Upper Vulcan Formations. The Jabiru, Challis and other intra-basinal horsts were partially to fully emergent at this time, and sand-rich fan deltas were shed from the Londonderry High and exposed horsts into the adjacent depositional lows, the Montara Formation forming from footwall erosion of exposed horsts and rotated fault blocks at the base of the syn-rift sequence. Deposition of the Upper Vulcan Formation was terminated by the Valanginian unconformity, marking the end of the syn-rift and a transition to passive margin conditions. Post-rift thermal subsidence commenced and resulted in widespread flooding of the continental margin. With continuing subsidence, Aptian to Albian marine sediments of the Jamieson Formation transgressed the area. A combination of restricted sediment supply and increasing water depth resulted in the accumulation of Upper Cretaceous fine-grained carbonates of the Woolaston and Gibson Formations. Continued deposition of a mixed carbonate–clastic ramp continued, until a sea-level fall led to the deposition in the Maastrichtian of the low-stand clastic fans of the Puffin Formation across the southern part of the Vulcan Sub-basin and adjacent Ashmore Platform. The Tertiary succession is characterized by the establishment of a sub-tropical carbonate platform as the Australian plate moved northward, climatic warming culminating in the development of tropical carbonates and reefs. This carbonate deposition was interrupted in the Early Eocene and Miocene by glacio-eustatic sea level lowstands, allowing prograding sand-prone deltas of the Grebe and Oliver formations to be deposited. The main source rock intervals recognized in the area to date are the marine-dominated Lower Vulcan Formation and more terrestrial fluvio-deltaics of the Early-Middle Jurassic Plover Formation, with the Lower Vulcan Formation considered to be the dominant source rock interval for both the oil and gas generated in the region. Clastic units within the pre- and syn-rift sequences host the majority of the identified petroleum accumulations. Reservoirs range in age from Triassic to Cretaceous with the main exploration targets being sandstones in the Upper Triassic Challis and Nome Formations, fluvio-deltaic sandstones of the Middle Jurassic Plover Formation, Oxfordian fandelta, shoreface/barrier bar sandstones of the Montara Formation, Tithonian submarine gravity flow fans of the Upper Vulcan Formation and submarine fans of the Upper Cretaceous Puffin Formation. Plays occur in stratigraphic traps, pinchouts, unconformity truncations, tilted fault blocks, horst blocks and anticlines, although to date most exploration wells in the region have been sited on narrow intra-basin horst blocks, tilted fault blocks or the major structural highs that form the margins of the basin-bounding terraces and flanking platforms. The Vulcan Sub-basin contains all of the critical elements needed to produce a successful petroleum system. High quality sandstone reservoirs are capped by regionally extensive and highly effective seals in areas with proven source rock presence, and hydrocarbons generated from these source rocks were able to migrate into a variety of robust fault bound traps. Limited depth of source penetration. Acquisition azimuth in the dip direction was critical in order to avoid any ambiguity with respect to the pre-processing testing, evaluation and parameter decisions, enabling a highly effective processing sequence maximizing the incremental improvements achieved. This also resulted in an accurate initial time velocity model. Previous surveys were acquired north-east to south-west, making processing parameterization in this complex area difficult and uncertain. Figure 2: PSDM gather located on the Crux Discovery. Triple source acquisition with shot interference removal was applied, increasing the spatial resolution of the data to assist pre-processing data integrity. 8.1 km streamers were critically important to image the structure of the deep, steeply-dipping horst blocks. These long far offsets properly processed ultimately provided far angle stack data, 34–46°, which has never previously been available for interpretation and high quality AVO/inversion processing. Figure 2 illustrates the quality of the pre-stack data at the Crux location with shallow primaries all the way out to 8 km. Broadband acquisition and processing technologies with DUG Broad deghosting were applied prior to demultiple, with notional signatures for each shot derived from recorded near-field hydrophone data used in debubble and zero phase processing. Demultiple processing, improved sampling and long offsets enabled a cascaded demultiple sequence to be carefully designed with a total of seven passes including 3D SRME, shallow water demultiple, interbed multiple elimination, Tau-P and parabolic radon. High fidelity velocity model building for depth migration, five hybrid iterations of tomography, including reef replacement and incorporating interpretation along the western margin of the Swan Graben to constrain rapid lateral velocity changes were undertaken. Depth migrating with a 75° maximum dip and 6.5 km half aperture for accurate migration of steeply dipping faults, together with data output to 14 km, make the dataset suitable for regional basin studies. Usable far angle data - the holy grail: historically 4.5 km streamers have been used in the area. To demonstrate the effectiveness of this vintage data, the Cygnus 3D PSTM raw 34-46° far angle stack data has been used to simulate this 4.5 km limited offset data (Figure 3a). This illustrates that reasonably reliable data was previously only achieved on the critical 34–46° far angle stack to a depth of ~3.0 km (~2.2s in time). Now, with 8.1 km offsets, a 34-46° far angle stack has reliable data over the important Jurassic to Triassic interval down to the top Permian, in some locations reaching ~6.5-7.0 km depth (~3.8s in time) (Figure 3b). Figure 3: (a) Cygnus 3D PSTM raw 34–46° far angle stack – simulated historical 4.5 km limited offset data. (b) Cygnus 3D PSTM raw 34–46° far angle stack – full 8.1 km offset data. The combination of the integrated solutions outlined above has produced a step change improvement in imaging in the Vulcan Sub-basin, allowing detailed investigation of the complex sub-surface for the first time, leading to new understanding of both the known, proven plays, and the potential for new plays never before imaged. The Norwegian Sea covers more than 200 000 km<sup>2</sup> of highly prospective acreage with many proven discoveries of Mezosoicand Cenozoic age. The large shelf area can be divided into three sub-regions.